When the skin is deprived of its natural fat sheath, which protects it against harmful external influences, it starts to suffer from withering, which leads to exfoliation, erythema, itching, and other forms of discomfort. The reasons for them could be many, but the most common ones are lack of vitamins, incapacitated blood circulation, diabetes, or the presence of fungus. Very common problem in everyday life, filled with sitting in front of a computer at work, driving for long periods of time, and wholesome lack of physical activity. They represent circular seals of the keratin layer of the epidermis of the skin, which appear after a continuous friction or pressure. 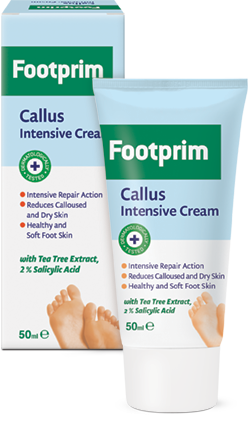 Are you experiencing problems with your foot skin? We know how unpleasant it feels! Nothing as small can cause so much discomfort and awkward moments! One little step in the daily care can change everything. The healthy and beautiful feet provide tone and confidence. 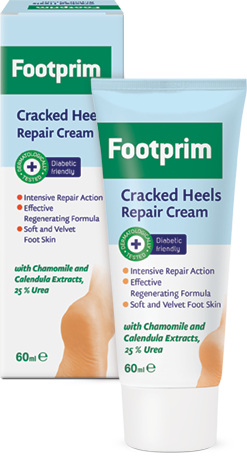 With the easy and effective care of Footprim, that result is felt immediately.